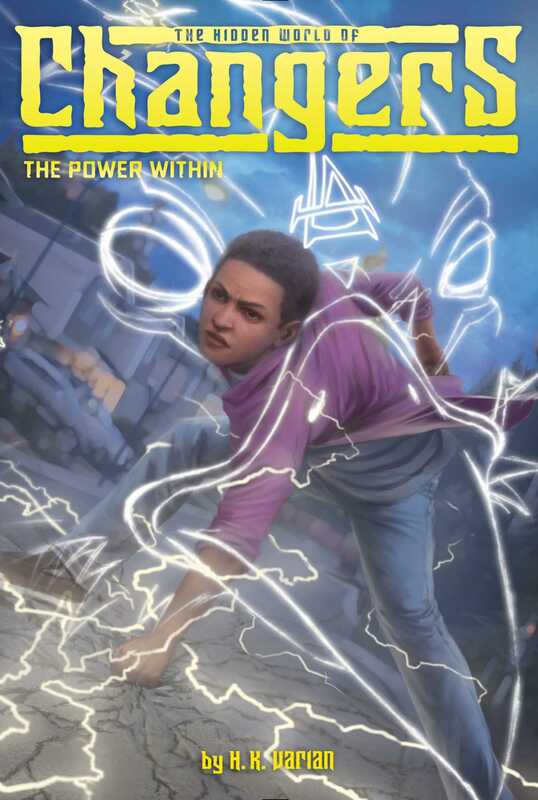 Darren receives a mysterious bracelet that helps him control his lightning abilities in the third action-packed novel of The Hidden World of Changers series! Darren, Fiona, Mack, and Gabriella are Changers, a magical line of shapeshifters that can transform into mythological creatures, from werewolves and selkies to lightning birds and spirit foxes. They still have a lot to learn when it comes to their powers, but the kids are finally showing some progress fighting as a team, and the First Four think they’re ready for a new mission. Young Changers in the area have been mysteriously disappearing, and it’s up to the kids to figure out who—or what—is behind it. But ever since his parents announced their divorce, Darren has been having a rough time coping…and his lightning abilities are going haywire. Just when Darren is about to lose control completely, he receives a mysterious bracelet—a bracelet that keeps his powers in check and makes him feel more in control than ever before. But after Mack and Fiona discover that one of the missing Changers had the same bracelet, they begin to wonder just who is helping Darren…or if the bracelet is meant to help him at all. In a small house across town, Mack Kimura sat across from his grandfather, Jiichan, for breakfast. As usual, Jiichan had prepared a simple Japanese breakfast for them: fluffy steamed rice, scrambled eggs, and a perfectly ripe banana—not to mention two fragrant cups of steaming green tea. But today, there was a big difference. Mack was surprised to also discover a bowl of cornflakes at his place. Jiichan pretended not to hear him as he lifted a silvery anchovy to his mouth. Mack tried to hide his smile but couldn’t quite manage it. For months, Mack and Jiichan had disagreed on just about everything—from what constituted appropriate breakfast foods to Mack’s name. Jiichan had insisted on calling him Makoto, while Mack preferred his more American-sounding nickname. Sometimes, it seemed like they couldn’t agree on anything. Then, on the first day of school, things had changed forever. That’s when Mack had learned a shocking truth about himself: he wasn’t just an average, ordinary kid like he’d always thought. Instead, Mack was a Changer. As a kitsune, he had the rare ability to turn himself into a magical fox with a ton of otherworldly powers. And Mack wasn’t alone. A few other kids at Willow Cove Middle School—Gabriella Rivera, Fiona Murphy, and Darren Smith—were Changers too, though each one was a different kind of shape-shifter. In a special class at the end of each school day, they honed their skills and learned how to control their powers—something that was easier said than done. Their teacher, Ms. Dorina Therian, was a werewolf Changer. She was also one of the First Four, an incredibly powerful group of Changers who have led Changer-kind for more than a thousand years. To Mack’s complete amazement, he had discovered that his own grandfather was one of the First Four too. A kitsune, like Mack. At first, Mack thought that Jiichan would be able to tell him exactly how to use his kitsune powers. But Jiichan refused, even though Mack was struggling terribly. He knew that Mack needed to figure it out for himself. But when an evil warlock, Auden Ironbound, attacked Willow Cove by using the Horn of Power to control all the adult Changers, it was up to Mack and his friends to stop him. Using their unique powers, Mack, Gabriella, Darren, and Fiona had dealt Auden a serious setback and nearly destroyed the Horn of Power, too, in their first-ever battle. Best of all, Mack and Jiichan had started to understand each other a little better—which made life easier for both of them. Mack shifted uncomfortably in his chair. He could guess what was coming next: a lecture. A few weeks ago, Mack and his friends had directly disobeyed the First Four by going on a secret mission to retrieve a powerful, magical relic, Circe’s Compass, from the bottom of the ocean—and the First Four were not happy about it. Even though the mission had been, for the most part, a success, there had been even more danger involved when some of Auden Ironbound’s followers had attacked Mack and his friends. Luckily, they were able to protect Circe’s Compass, but the First Four didn’t like being disobeyed. Mack sat up straighter. That was not what he expected Jiichan to say. “But I thought—” he began. “Isn’t,” Mack finished for him. Mack opened his mouth to argue—he would never be vulnerable to Auden Ironbound or his goons; Mack was sure of it—but he caught himself just in time. “Um . . . I think so,” Mack said, choosing his words carefully. The truth was, Jiichan’s words were almost incomprehensible to him. Say no to a mission? Not in this lifetime, Mack thought. He couldn’t imagine anything that would stop him from battling Auden Ironbound whenever he had the chance. From the way his grandfather looked at him, Mack suspected that Jiichan already knew that. “Know your strengths and your limits, and never be afraid to call on an ally when in need,” Jiichan said with such a piercing look in his eyes that Mack had to look away. When Mack climbed onto the school bus a couple minutes later, his best friend, Joel Hastings, had saved him a seat, like always. That was all Joel had to say for Mack to know what he was talking about: the latest issue of their favorite comic, Agent Underworld, which had gone on sale just twenty-four hours before. “Of course I did,” Mack replied. Joel nodded knowingly. “That’s when superhero teams come in,” he said. “Strength in numbers?” said Mack. Joel was still chattering nonstop about Extreme Marauders as the bus pulled up to Willow Cove Middle School. When he noticed Fiona Murphy waiting at Mack’s locker, though, Joel gave Mack a nudge. “Nice,” he said with a goofy grin on his face. “Sure,” Joel replied, still grinning. “If you say so.” Then he punched Mack in the arm and headed off toward his own locker. “Hey,” Mack said as he approached Fiona. “Happy Monday,” she replied, shifting the heavy stack of books in her arms. Fiona wasn’t one to be seen without a few books in hand, but Mack knew why she was lugging them around instead of carrying them in her backpack. Fiona’s backpack was where she kept her most precious possession: her selkie cloak. Without her cloak, Fiona would lose the ability to transform into a seal. Someone had hidden the cloak from Fiona long ago, when she was just a little baby; after she had found it a few months ago, she vowed to never be separated from it again. Since then, Fiona had been extra gentle with her cloak—she didn’t like to cram too many things into her backpack with it. A wry smile crossed Fiona’s lips. “Trust me, I’m not just waiting around,” she said. “What do you mean?” Mack asked, a little too eagerly—and a little too loudly. “I have some leads I’m investigating on my own,” she began. Darren, though, stared straight ahead as he shuffled down the hall. It was like he couldn’t even hear her. “That’s weird,” Mack said, scrunching his face into a frown. Darren was nearly about to pass them when Mack reached out and grabbed his arm, jolting Darren out of his thoughts. At the same time, the lights flickered ominously overhead. The usual morning chatter that filled the halls of Willow Cove Middle School went silent as everyone stared upward. Then, as if nothing had happened, the lights went on again, and the students continued getting ready for homeroom. “Of course,” Fiona said, stepping aside quickly. Darren’s homeroom teacher was superstrict and loved to start the day by giving out a detention or two. “I’ll see you guys later,” Darren said. Then he turned and disappeared into the crowd of kids making their way down the hall. “Well, that was weird,” Mack said as soon as Darren was out of earshot. “Something must be bothering him,” Fiona agreed.